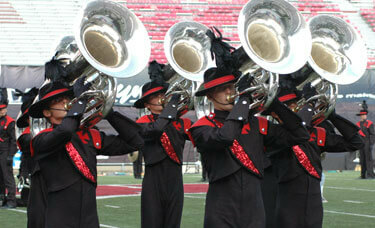 Crossmen have announced that Rick Villarreal will serve the corps in 2007 as brass caption supervisor. Villarreal is in his 20th year as a music educator in the state of Texas. A graduate of Texas Tech University, his ensembles have received acclaim in both the middle school and high school grade levels. His teaching experience includes tenures in the Midland, Lewisville, Lubbock and Birdville school districts. The corps also is in discussion to retain Aaron Goldberg who has served on the Crossmen brass staff for the past three years. In addition; Al Chez, CBS Late Show trumpeter, will continue with the corps as a consultant, assisting as his schedule allows. Read more on www.yea.org. Crossmen tuba players perform during the Quarterfinals competition at the 2006 DCI World Championships in Madison, Wis.